The following history of the Brittan Party House is excerpted from an article by Paul D. Buchanan originally published on 2 September 2002 in The Daily Journal. The complete article is available at smdailyjournal.com. The Bohemian Club was founded in 1872 by [San Carlos pioneer Nathaniel] Brittan and a group of San Francisco artists and journalists to create a venue in which to share ideas about their various crafts. Brittan became president of the club in 1892....this house in the hills of San Carlos became renowned as the house of fun for Brittan and his Bohemian Club buddies. Built of solid redwood in an octagonal design, this Victorian-style structure featured shiplap siding, steep gables and a flagpole rising 22 feet above the witch's cap on the top of a white, windowed cupola. 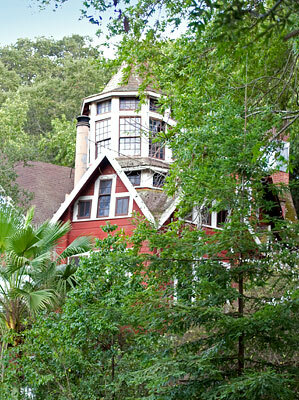 This cupola and flagpole still peak out among the grove of wild trees which surround it. Owned by Judy Ann Leydig today, the house exterior reportedly appears largely as it did more than 130 years ago. According to San Mateo County Historical Association records, the second story served as a gaming room in Nat's day, complete with billiards table. The third floor became the party floor, with a 1,000-foot main room for his wonderful celebrations. The floor also included a walk-in Inglewood [sic] brick fireplace, around which Nat and his companions would sit, roasting the venison from the day's hunt. Brittan and his Bohemian Club friends apparently partied loudly and frequently, which is how Brittan's hunting lodge earned the nickname "the Party House."